If you are looking for a reliable Magento 2 landing page tool for campaigns, you’ve come to the right place. 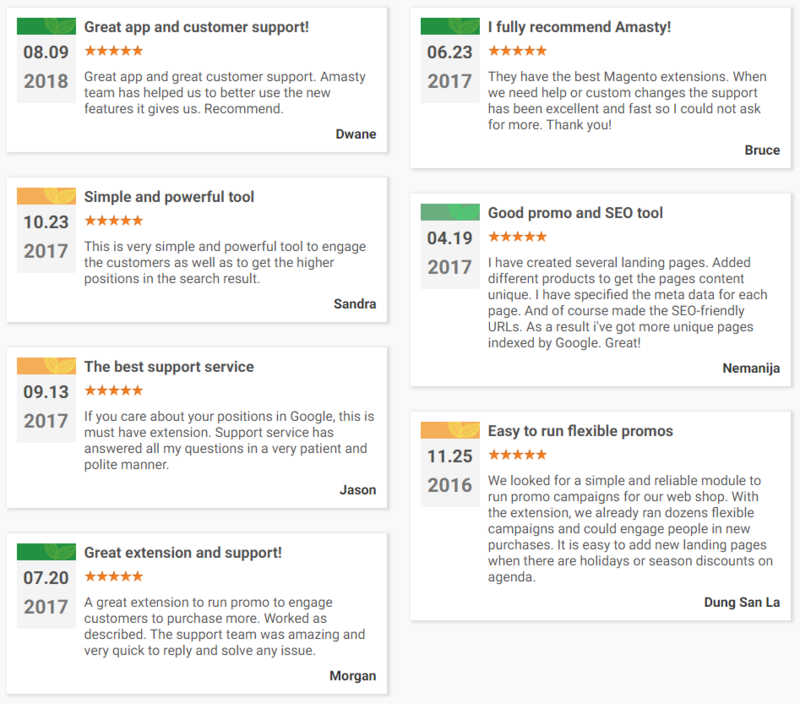 Below, we shed light on the Amasty Landing Pages Magento 2 extension. The module provides the ability to introduce unique content, generates only Google-friendly URLs, and supports custom meta tags. So, as a Magento 2 administrator, you can easily apply the relevant meta title, description, and keywords to all landing pages. 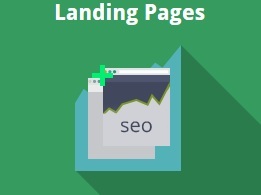 This feature allows creating SEO friendly landing pages that will always be displayed among top search results. Another vital SEO improvement that the Amasty Landing Pages Magento 2 extension provides is the ability to use canonical URLs. Thus, you avoid duplicate content issues, making landing pages more appealing for search engines. Besides, category URL suffixes are supported by this Magento 2 landing page plugin. The Magento 2 landing page extension also allows creating dynamic categories based on landing pages. For these virtual categories, you can set various conditions depending on how you want the category to be displayed. Note that category products will be reassigned automatically with the module’s settings. It is also necessary to mention that you can easily create user-friendly URLs for landing pages. For example, all hot deals can be gathered under exmpl.com/hot-deals. Such a URL will also be SEO friendly. As a store administrator, you can streamline vast backend opportunities, like Magento category landing pages. For instance, the Amasty Landing Pages Magento 2 module allows admins to create templates based on various conditions like SKU, price, category, etc. Thus, you can create a highly targeted Magento 2 landing page for the category that will display only goods from specific manufacturers. Moreover, Magento 2 landing page design settings are very flexible, so the appearance of your landing pages can be really unique. Feel free to add images, promo texts, and various CMS blocks to make your store stand out among other digital storefronts. Besides, by modifying a sitemap each time a new landing page is added to your store, you increase its effectiveness by helping bots crawl your store and index new content. Another important feature allows you to import/export landing pages via CSV with all their elements. Note that a CSV file can be modified before import. 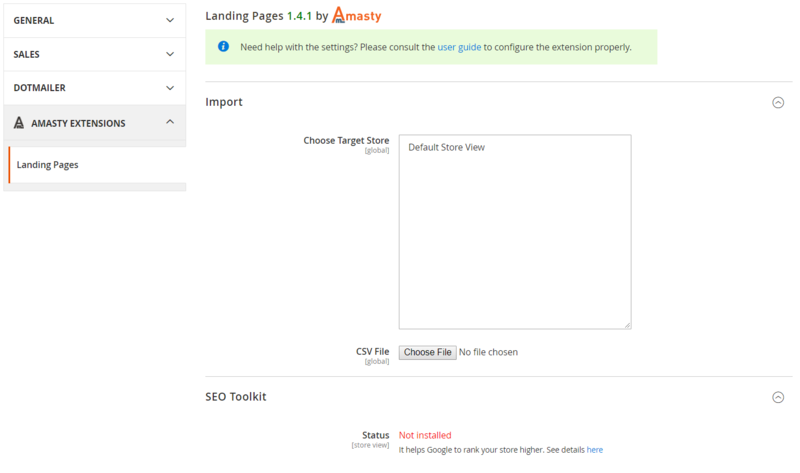 Let’s see how to configure the Amasty Landing Pages Magento 2 extension and create landing pages with its help. To configure main settings of the extension, go to Stores -> Settings -> Configuration -> Amasty Extensions -> Landing Pages. 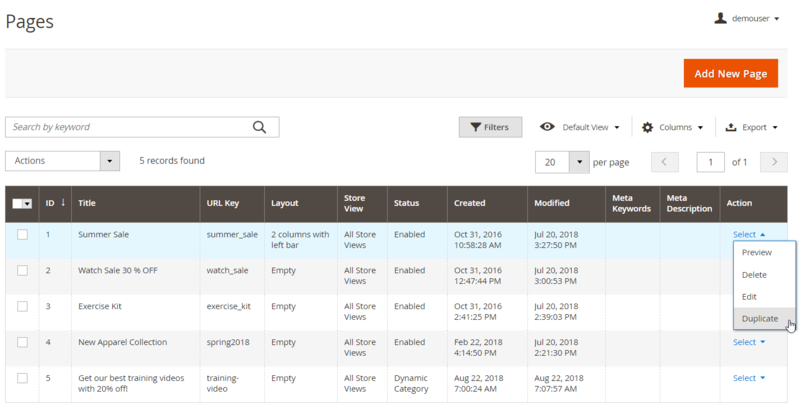 In the first tab here, you can choose a target store for which to import a CSV file with landing pages. Next, the Magento 2 Landing Pages module lets you utilize the functionality of Amasty SEO Toolkit if it is installed on your website. As for landing pages, they are available under Content -> Landing Pages -> Pages. All pages are gathered in the grid that displays such parameters as page title, URL key, layout, store view, day and time of creation/modification, as well as meta keywords and description. In the Action column, you can preview, edit, delete, or duplicate each page. Besides, it is possible to delete, disable, or enable pages in bulk. Now, let’s see how to create a new landing page. While on a grid page, hit the Add New Page button, and you will be redirected to a new screen split into four tabs: Page Information, Design, Meta Data, and Conditions. 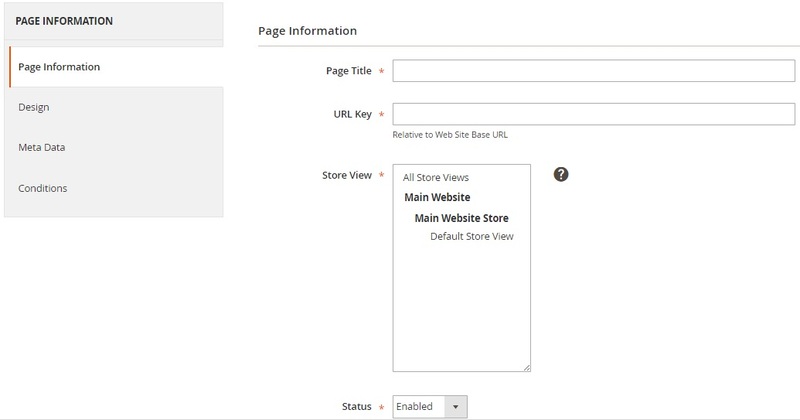 Under the first tab, specify page title, URL key, select store views, and activate the page. 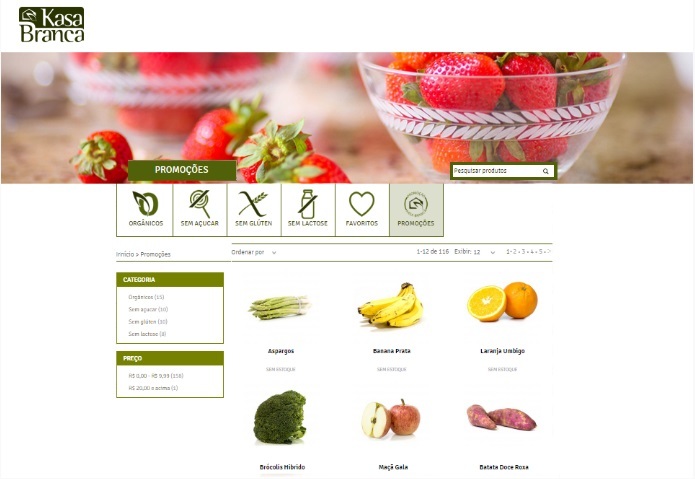 In Design settings, select a layout (1 column, 2 columns with left bar, 2 columns with right bar, 3 columns, or empty) and the amount of columns in a product grid (3, 4, or 5), decide whether to include navigation or not, type in a heading, upload an image and specify its Alt tag, create top and bottom descriptions, select top and bottom static blocks, and specify default product listing sorting and layout update for XML. In Meta Data, insert meta title, keywords, and description in the relevant fields. The last tab allows creating various conditions making product selection for the new landing page more precise. You must admit that creating a new landing page with Amasty Landing Pages for Magento 2 is a piece of cake, but what about the frontend appearance? Now virtual (dynamic) categories can be set based on landing pages and their conditions. New feature: now it is possible to duplicate landing pages on the Pages grid. Possibility to specify meta title, description, and keywords of a landing page for multiple store views was introduced. ‘Rating’ condition was added to the landing page settings. 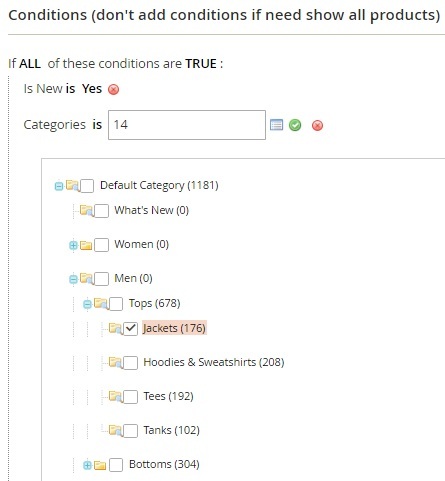 The ability to allow non-unique URL keys for different stores was implemented.